Elmo Toys for Toddlers - 14 Gifts They'll Actually Play With! If your toddler is anything like mine, he or she is definitely obsessed with Elmo. There can literally never be enough Elmo toys in the house for my boys which is why Elmo gifts for toddlers are my go-to choice. There are other obsessions too, like Paw Patrol for example, but Elmo toys are near and dear to their hearts. Disclosure: this post contains commissioned links. Elmo toys and paraphernalia play an important role in my boys’ life; so much so, that M has even dressed up as him. So, because I figured many of you are in the same boat as me, I took the time to hunt for some of the best, exclusively Elmo toys for toddlers and babies on the web and gathered them all in one place. I’ll confess: it was a bit challenging. Many toys are discontinued. That includes many of our personal favorites. Those that I couldn’t leave off this list, simply because of how much my kids love them, I hunted down for you regardless and found a place where you can still buy them for a reasonable price. Got a 2+ year old? You’re in luck- most Elmo toys for toddlers and 2 year olds are geared towards ages 2-4. But you should DEFINITELY read the age recommendation on each toy. When your toddler hugs their favorite toy, what could be better than their favorite toy hugging them right back? This hugging, talking, nap-taking Elmo toy is the perfect companion for your Elmo obsessed toddler. I love that it’s more than just a stuffed doll; it’s interactive, so your toddler will spend hours toting it around, and spending time with their new best friend. Get ready for giggles! This Elmo’s got jokes! 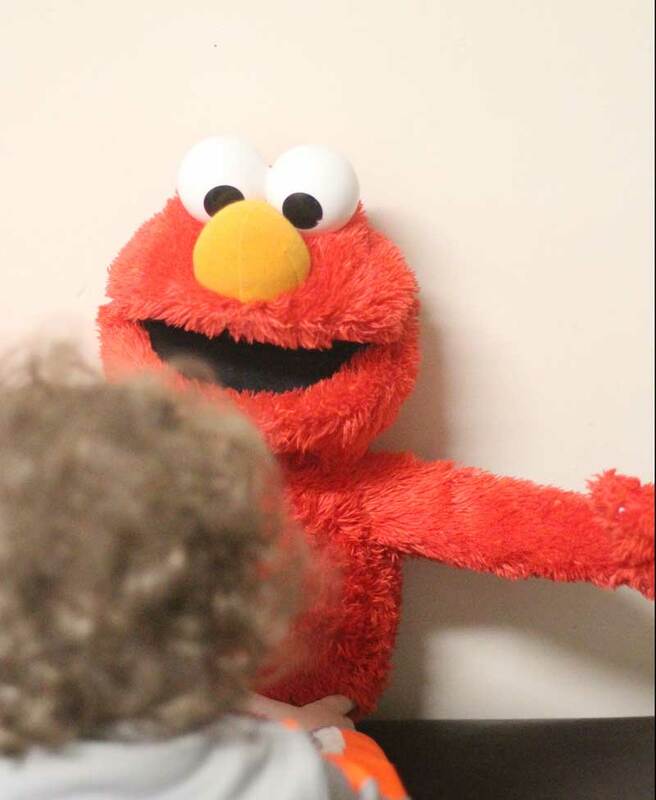 This Elmo doll is another fun, interactive Elmo that your toddler will spend hours with. When you press his feet, Elmo will tell you jokes and make silly sounds. And if you make silly sounds, you’ll get Elmo rolling! 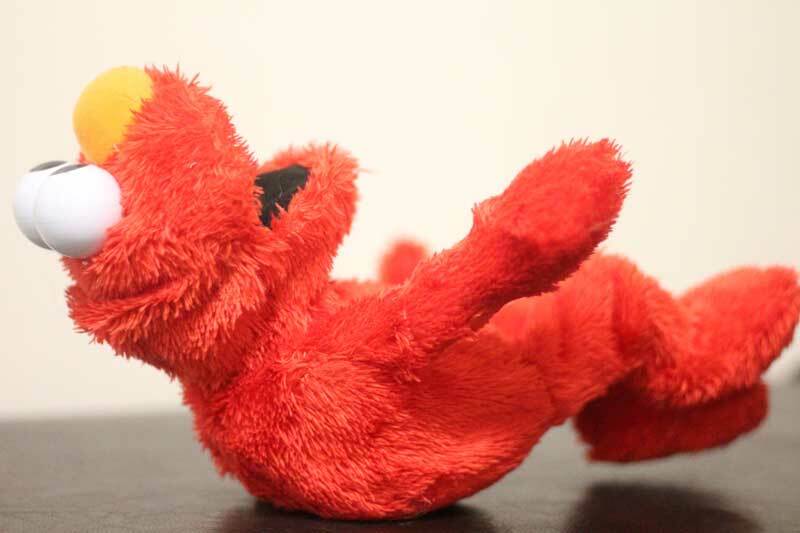 Elmo loves a good laugh- the more he laughs, the more he rolls around and shakes! 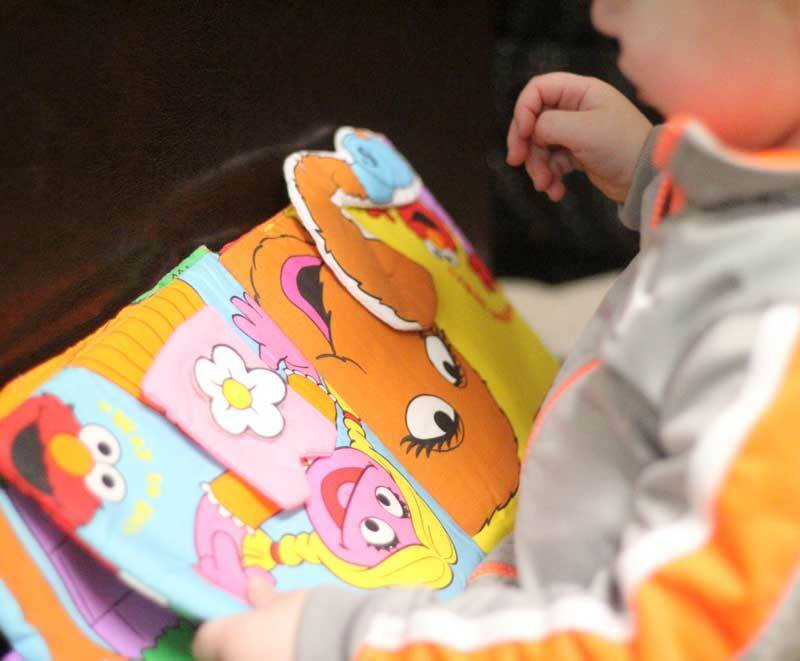 Your toddler will absolutely delight in this adorable Elmo book. Your toddler will learn about different kinds of clothes. The hands-on parts make for a great fine-motor development activity. Learn about zippers, buttons, buckles and more. For a toddler just learning to dress him or herself, this Elmo toy is a great visual and tactical aid. The book, by virtue of the fact that it features their favorite Sesame Street character, will excite and motivate them. If your toddler is just starting playgroup, this is the perfect toy to get them excited about school! Each part of the playset, including things like a plush pencil squeaker and an apple rattle, has a fun noise that puts a smile on any kid’s face. This Elmo toy encourages lots of imaginative play (my favorite kind of play), and, a plus for Moms: it’s washable! This awesome Elmo flashlight has different modes and settings to encourage imaginative play and exploring! Your toddler will have fun turning the slides to shine pictures of Elmo in various poses onto the wall. He can also use it as a regular flashlight (and I don’t know a toddler who ISN’T obsessed with flashlights!). It even has a setting for an older toddler to use as a small bedside light! 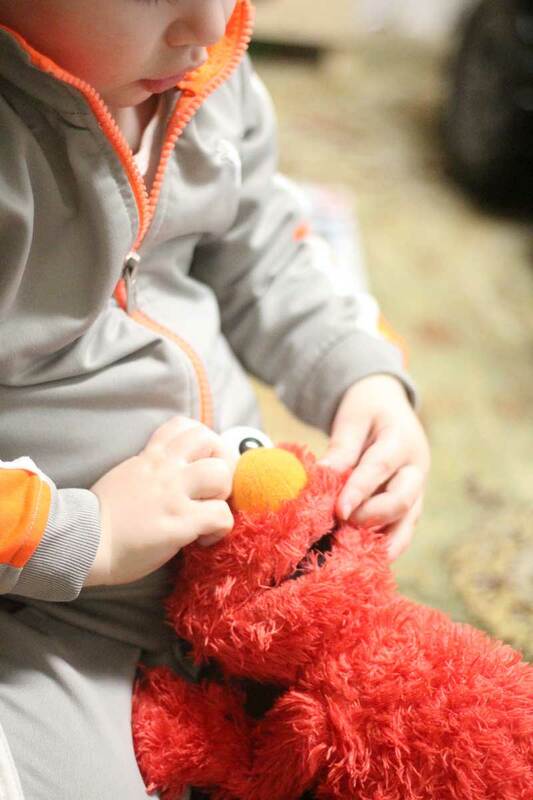 This Elmo toy is fun, educational and travel-friendly all in one! Toddlers just learning their letters will love exploring the alphabet in this fun storage case. The letters all come out and kids can snap them into the right back into place, or mix ’em up and try to spell out simple words, like their name! They can practice the sound each letter makes by matching it to a corresponding picture underneath each letter. It’s a great toy if you’re looking for more quiet play; no noises, no lights and no batteries required. Does your toddler love to dance and play to some good music? Obsessed with Elmo + obsessed with music = this easy answer! Bring out your child’s inner rock star with this terrific Elmo guitar. With light-up keys and three fun play modes, your toddler won’t put this down! The Color mode lets you rock out to colors and sounds, and Free Play mode lets you create your own song. If you’ve got a young tot age 2 years old or under, it can be a bit harder to find. Most of these are recommended for age 18 months and up, but if you’re looking for a first birthday gift, fear not – it’s GOOD to get a gift a baby can grow into. If you’re not sure which of these Elmo toys for toddlers is suitable as a birthday gift, a gift card in these Elmo pillow boxes is also a great way to give the gift of Elmo. Also, double check the age recommendations since some Elmo toys are recommended from 12 months. 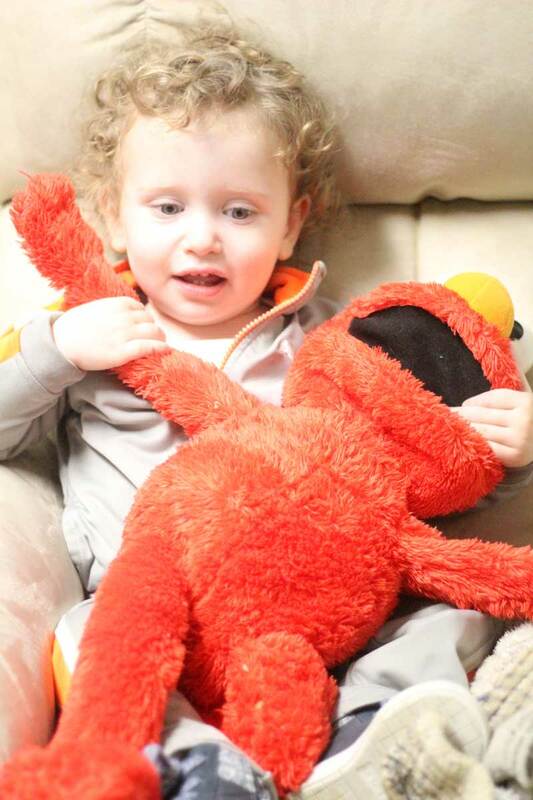 This plush, soft and huggable Elmo is the perfect “first Elmo” for a new Sesame Street fan. The quality is great and it has authentic features. It’s perfect for the younger toddler age range; where they’re just getting excited over dolls and huggies. Nothing will make them smile wider than their favorite Elmo doll. And my favorite part? It’s machine washable! This is a great toy even if your kid is not Elmo-obsessed! Elmo will help teach your child things like number recognition, colors and counting. Play in one of two modes, Explore or Question. It’s super educational and interactive, and fun for all ages. The compact size is perfect for small hands. And while the song is catchy, it has an off button if you need it! I’m always looking for new and exciting bath toys that actually dry, and this Elmo bath toy is no exception. Elmo is ready for a swim in his cute swimsuit made of quick dry fabric. Hang it to dry with a convenient storage loop. If you have a toddler who is hesitant at bath time, bringing Elmo along for the fun will make it a whole new experience! Not just featuring Elmo, this Sesame Street gear toy is great for beginning counting and colors. The eight gears are interchangeable to arrange, stack and spin. No batteries required for this toy- all you gotta do is press Elmo’s nose! This Elmo toy is great for in or out of the bath. Every part of the steamboat is functional in water, with a water strainer and scooper and a Captain Elmo squirt toy! This toy is really a 5-in-1; it actually comes apart with 5 separate water toys, so there is lots to keep your toddler entertained with! If you keep the boat assembled, it is a quality bath toy that actually floats instead of flopping over to one side. Whether he plays with it in or out of water, it will definitely make playtime more enjoyable. This adorable, talking, moving Elmo comes complete with a blanket personalized with your child’s name! It will become a keepsake for forever. And while your toddler is still young, she will enjoy the 13 fun phrases that soft and cuddly Elmo can say, while his arms move up and down. If your toddler wants to match her favorite Elmo toy, this no-sew t-shirt is super easy to make! Your toddler will love listening to Elmo recite five classic nursery rhymes! Elmo doesn’t just recite them, he gets animated while doing so! Listen to rhymes like Mary Had a Little Lamb and Twinkle, Twinkle Little Star with Elmo’s own special version. This Elmo toy is a perfect “only before bedtime” toy (especially if you need to beg out of reading another bedtime story). What are your favorite Elmo toys for toddlers and for 2 year olds? Comment below! Gift Ideas, Mom life, Preschoolers, Toddlers. Bookmark.